Ever since I left the Story Seminar I have been trying to figure out the controlling idea of my story. I figure as I rewrite, I should have this clearly in mind, so it can help me guide the changes and ensure consistency. I noodled on it while driving, while cooking, while waiting for a hockey game to start – pretty much anytime it comes to mind, I’m working the problem in my head. As I have a couple of driving reasons to get this rewrite finished, I decided I would sit down once and for all and decide on one. I wrote down a list of potential lines. Nothing seemed right, and finally, tonight, I understand why. I went back to two books – Story, by Robert McKee, as mentioned a couple times now, and, John Truby’s The Anatomy of Story. 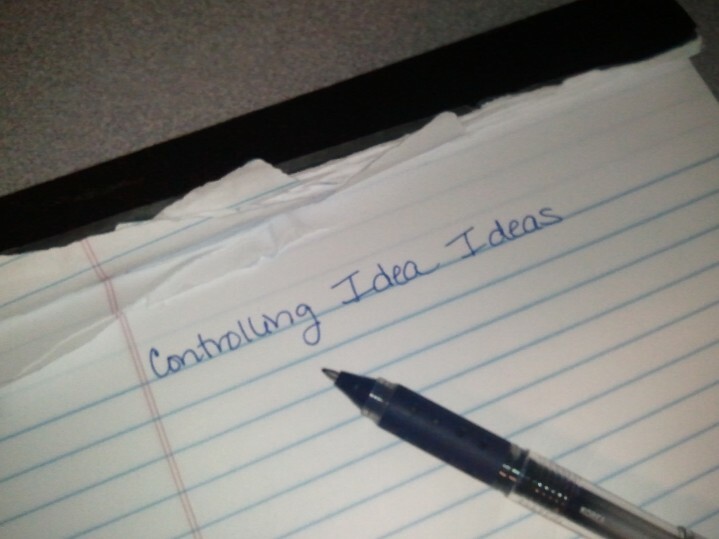 It’s from McKee that I use the phrase Controlling Idea. Truby calls it a Theme Line. In either case, it is the essence of what your story is about – a value change – Truby would say a moral value – and a cause – the human behavior. Now, I had this understanding with all of my noodling. But, how you figure it out, well, it differs between these two authors. McKee says that the well written story tells you what it is – by evaluating the climax of the story, seeing what value is brought to the protagonist. Ah-ha – this was a huge relief to re-read in the Story book. I don’t need to get hung up on figuring it out, but the story, when done, should make this easy to state. Now, Truby, if I follow his thinking correctly, presents that this should be tackled fairly early in planning the story, through analysis of other fundamental aspects of the premise of the story. Perhaps when I get to seriously developing one of my other story ideas, I’ll try shaping it up front, but in the case of my rewrite, I think I will go the route of letting the story tell me the controlling idea, rather than trying to retrofit one. I can’t believe it’s already been two full weeks since I completed the Story Seminar. After an extra day off in L.A., and flying home, it was right back into the daily grind of work and home duties. I knew I should have just written a post while I was still there! Still, the time has given me time to reflect and decide which thoughts to share, from the four days. As an amateur, I wasn’t sure I should be spending this much on a set of talks on screenwriting. I had investigated less expensive options, through local community school and Seattle Film school offerings, and investigated other traveling pro-workshops that might be passing through the Pacific Northwest. But then, as I was trying to at least read books I hadn’t read yet, and re-read books I knew were valuable, to focus my rewriting efforts, I found, in one book, the mention of McKee’s seminar as a must-do. Honestly, even then, if it were anywhere but my favorite place in the world – L.A., specifically near Manhattan Beach – I might have still waited. But I’m so glad I didn’t. It is rare in my life that looking under the hood, or behind the curtain, of something I truly love does not ruin or degrade that love. Such as my brief student internship at NASA in the late 80s. I expected everything to be modern and advanced, to be space-age-like. Instead, it seemed to be an organization stuck in the 50s, in personnel and their wardrobes, office technology and practices. The workers that had been around seemed beaten down by bureaucracy. But, unlike that experience, learning about what makes movies work, made me love movies even more. I will not watch another movie or television program without seeing them in a whole new way, and I am happy about that – not sad. In fact, by the end of the third day, I no longer felt bad for liking commercial movies, and I found a new appreciation for genres that I haven’t really liked up until now. I do not think it would be appropriate for me to summarize here all of the key lessons, as you should buy the book or attend the seminar if that’s what you want. It’s not that I don’t have details – I took 60 single-sided pages of notes. But, I do think I can share what I liked and didn’t care for. The days are indeed long, with 8 hours of talks worked into a 10 hour daily schedule. It’s a grind, for sure, but for me that was a good thing. Total immersion was effective. And managing a few days together was logistically easier than, say, 16 2-hour sessions over as many weeks. Part of what made the seminar wonderful was that the full seminar – all 32 hours – is, itself, scripted. And, after thirty years of doing this seminar, it was certainly well rehearsed. While at times you felt like your class was unique, with McKee going off on little tangents about current events, society or a particular scene in a recent film, most of the time you could see the class progressing through the curriculum as designed, complete with deliberate mannerisms and delivery of punch lines. On the down side, movements you thought were natural and charming day one were a bit annoyingly predictable by day four. (For me this was also true of the tangents, which students were fairly warned of in the handout at start of class, which usually consisted of extreme opinions, and often not politically correct ways. Some I agreed with, some I did not, and some I simply wrote off to generational gap.) Ultimately, the scripted nature assured that you covered all of the material. And, with clear, if rigid, rules about participating in the seminar, you know your time and investment is respected and that b.s. on the part of your cohort won’t be tolerated. This was true of even the final day, mostly spent bonding with 230 other people, through an analysis of Casablanca and a champagne toast in its honor. This was a great finale – a bittersweet one. On one hand you are done being in that classroom, on the other, you feel like you could listen four more, even eight more days, trying to sponge more knowledge from McKee. You scoop up various books and media for sale (which I will review here in the future), hoping to take a piece of McKee home with you (I don’t, by the way, recommend the topic DVDs; was surprised at the age and brevity of the content on the one I purchased). You can see why Storylogue was created and if you didn’t think you would subscribe before class, you are probably convinced you must by class end. In the end you leave feeling like you witnessed your own little piece of history and that you graduated into a very special part of the film industry – you are a McKee student.